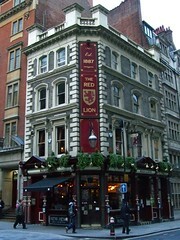 Pub located between Moorgate Station and Liverpool Street Station. Was in the 2007 Good Beer Guide but not the 2008 one. bob and Richard visited on a Wednesday evening in September 2010. The place was half full. Real ales available were Spitfire (£3.23), Doom Bar (£3.10), and London Gold. Two other pumps had London Pride and Deuchars IPA clips, with signs indicating that they'd be coming on soon. Last visited by bob and Richard, 15 September 2010. Opening times taken from the 2007 Good Beer Guide. Last edited 2013-05-10 07:54:51 (version 16; diff). List all versions. Page last edited 2013-05-10 07:54:51 (version 16).